Devastation in the Salaheddine neighborhood of Aleppo. Photo by James Harkin. There’s a short stretch of main road on the drive into rebel-held Aleppo, when you pass a prison that’s one of the last holdouts for the Syrian Army in this area, where the cars speed up. “This bit is dangerous. Sometimes the army shoots at us,” barks Abdul Kareem, before jolting the accelerator. I haven’t seen Abdul Kareem for nearly a year. “I’m sorry for your loss,” is how I greet him. By this I mean his eldest son, Ayham, a 25-year-old battalion commander in the Free Syrian Army (FSA). Last July, on the day the rebels launched their assault on the city, Abdul Kareem brought both Ayham and his second-oldest son, Molham, from Zitan, the family’s village where they’d been fighting, for me to interview. Whereas Molham was a pensive, thoughtful type and couldn’t wait to return to his architecture studies at Aleppo University, Ayham was more like his father—driven and brusquely authoritative, impatient to get back to the fray. We kept in touch on Skype, and two weeks later he let me know he’d been stationed in Salaheddine, the first district of central Aleppo breached by the rebels and the site of some of the thickest fighting. A week later, the news came that he’d been killed by sniper fire. The “other one” is the reason for our journey. On a whim earlier that morning, Abdul Kareem had offered to take me from the refugee camp in Turkey where he and the remainder of his family live to see Molham at the front line. The last time I came here, the rebels had just taken Azaz, a historic and strategically important town with twin minarets just five kilometers from the border. As Abdul Kareem walks me around it, however, I see that their prize is now a ghost town. Most of the civilians have fled, and the best buildings have been destroyed, first by airstrikes from the forces of Bashar al-Assad’s Baathist regime and then, a week before I arrive, by a ballistic missile. The hundreds of disparate battalions working under the loose umbrella of the FSA have made some progress here, but only inch by inch, and at incredible cost—and even then only with the help of Islamic fundamentalists like Jabhat al-Nusra, who recently pledged their fealty to Al Qaeda. At many of the checkpoints, rebels from the two different groups are indistinguishable. “Most of these lorries and pickup trucks are Free Army, you know,” says Abdul Kareem as we reach the edge of Aleppo City. “You can tell because they’re all broken down.” Shortly after that, a chunky four-by-four with tinted windows races past us, the black flag favored by Islamists hanging off its back. In the constantly shifting landscape of Syria’s armed rebellion, it takes only a few dozen men to establish a katiba, or battalion. Molham’s consists of 100 fighters; together, they occupy five different positions on the front line and hole up in three or four makeshift barracks between shifts. The last time I met him and his older brother, their battalion went under the name of Omar al-Mukhtar, an Arab anti-colonial hero. Now they’re known as the Abu Ayuub al-Ansari, after a close companion of the Prophet Muhammad. The name change might be significant. At the dilapidated school just behind the front line where Abdul Kareem takes me to meet them, I see none of the three-starred paraphernalia of the FSA; instead, there are black posters inscribed with the words “There Is No God but God” and battered-looking posters of armed men in Islamist headgear. The only evidence of any politics is daubed in spray paint on the wall outside: “Russia Is the Enemy.” Only 200 meters from Syrian Army positions in al-Izaa, it’s not entirely safe. Shortly after we arrive, I walk outside to use the loo and emerge to hear some commotion; a sniper, Abdul Kareem informs me, has just taken a chunk of concrete out of the front door. Last summer, the rebels here were hopeful they could take Aleppo in a matter of months, but now they’re bogged down in a gruesome stalemate. I join some of them in the school office. While Youness, a 22-year-old cousin of Abdul Kareem’s and the joker of the unit, sits behind the headmaster’s desk pretending to be the governor of Aleppo, I tell Molham that he looks tired and older than I remember him. “I am fatigued, but not from sleep,” he says, “but from everything that has happened.” I ask if he’s become more religious in the last year. “When we are so close to death, we all become more religious,” Molham replies. He confesses that the rebels shouldn’t have launched their attack on Aleppo until they were sure they could take it, and his expression suddenly becomes gloomy. “The dream is over,” he says, and then promptly qualifies it: “Now, nobody cares about the future of Syria. All we want to do is finish this regime, no matter what the cost.” He asks me if I’ve heard about the death of his 5-year-old cousin Khalil. “It is things like this that make us hate, and the hatred in our hearts is growing,” Molham says. “I worry that one day it will be bigger than our dreams.” It’s only when he sits cross-legged at the front of the large schoolroom and delivers a speech full of earthy humor that I realize he’s taken Ayham’s place as battalion commander. When Molham is finished, I ask about the rise of puritanical Sunni Islamists like Jabhat al-Nusra, who seem to want to turn Syria into a medieval caliphate. “I respect their beliefs. I don’t smoke when I’m around them, for example,” he tells me. Like all the rebels I spoke to, Molham insists that, regime claims to the contrary, the vast majority are Syrian, even if their leadership and expertise often come from Iraq and elsewhere. “Most of them are not radical and don’t agree with what their leaders say; they simply want to fight the regime. They don’t like the Alawites or the Shiites, but they don’t mind Christians. And because they’re not afraid of death, they are good fighters and very popular. We meet them and have talked about working together.” All the same, he worries about where this is headed. “When this is over, we will meet with them and discuss everything. If they take power, they will want to fight everyone. ridden, turns over to take an injection in his rear end; four stand to pray in formation. The injured rebel from Homs stares intently at a bank of four CCTV cameras and talks into his walkie-talkie. Every so often, rebels go around the room shaking everyone’s hand before returning to the front. When a bearded young man stands up to go, everyone breaks into a romantic ballad in which they affect to be saying goodbye for the last time. It’s not altogether lighthearted; the battalion is losing someone almost every week. Only a few days before I arrive, a 22-year-old former economics student at Aleppo University was ambushed and killed by regime forces in al-Izaa. Just as I’m about to fall asleep, I hear shouting from the street outside. Locals who double as police have brought in four men, accusing them of theft and possibly murder. One is a former member of the FSA, and all were pretending to be working for another rebel unit when they were caught. It’s a big problem, says Abdul Kareem; given the amorphous nature of the organization, anyone can claim rebel status and loot the area. “We can’t clean ourselves properly because we are too busy fighting,” he adds. The detainees are taken to a room at the end of the corridor, and late into the night I hear flesh being slapped and terrible screams. I get up and sit on the balcony with the other men, spitting out the shells of tiny Syrian nuts and listening to a regime helicopter hovering overhead; no one says anything. “Thieves,” shrugs Abdul Kareem. The next morning I’m awoken by a woman, apparently a relative of one of the alleged thieves, wailing and yelling at a rebel sentry in the street outside. The previous evening, Molham had offered to take me to the front line at Salaheddine; he’d even given me a military pep talk. For the rebels, he said, the battle for Salaheddine wasn’t really about strategy. It had been the first big engagement for them on their way into central Aleppo, so winning it outright was “a matter of honor,” he told me. On the way, however, he had other business to attend to; Youness had sustained a minor shoulder injury. We stopped at the street clinic of a local healer, a wizened old man in an Arabic headdress. Before he would treat Youness, however, he wanted to give everyone a piece of his mind. Some FSA units, he said, were nothing better than thieves and bandits; no one seemed to want to do anything about it. Eventually Abdul Kareem calmed him down, saying he’d see what he could do. Very little can prepare you for the epic scale of destruction in Salaheddine. In the worst-affected streets, barely a house has been left untouched; a weightless, otherworldly quiet obscures the fact that many poor Aleppans are still living here among the ruins. When the car can take us no farther, we get out and stumble through the wreckage. Just behind the pockmarked dome of the area’s main mosque, Molham shows me a grassy yard where the rebels bury their dead in shallow graves; the fighting here is so intense that they have no time to bury them properly. As the streets narrow, drapes hang on the upper floors to block the view of snipers. It’s only when we arrive that I realize they’ve taken me to where Ayham was killed last August. Molham, standing in the exact spot where it happened, points out the remains of a makeshift clinic where rebel-friendly doctors had been working when regime forces stormed the area. As we stand there, another group of rebels is preparing to go into battle: a white van packed with men wearing black Islamist bandannas fires itself up with cries of “Allahu Akbar!” before speeding off toward government lines. Molham says that his unit handed the alleged killer over to a secret rebel court, where his testimony was being checked by human rights activists and lawyers. There is no way to verify this, and no prospect of an interview with the suspect. Torture and criminality are rife on all sides in Aleppo; confessions extracted under such conditions have doubtful value. What’s clear, however, is that the disparate rebel factions are working hard to establish an alternative administrative and judicial system in the areas under their control. After we drop Molham off, Abdul Kareem takes me to the Al Shaar district to see it in action. In an open-plan office space above a factory humming with sewing machines, I find a long row of young men and women typing away at computers. Each table is responsible for its own municipal area: one for civilian defense, another for engineering projects, another for rebel-held hospitals and medical supplies. Everything is in embryo; the office has only been open a month, and the 25-year-old doctor who shows me around has only been working here for two days. At a longer table in the middle, Abdul Kareem introduces me to a stout, balding man dressed in a suit. His name is Yasin Hilal, and he is an administrative official in rebel-held Aleppo as well as a leading figure in a rebel association of lawyers and judges, many of whom have defected from government areas. When I ask what kind of legal system the rebels are setting up, Hilal responds that its principles are those common to many Arab countries, combining elements of Islamic and civil law. It also comes with two kinds of courts: one to settle civil disputes, the other a network of secret military courts to try those accused of working for the regime. Though he doesn’t exactly say so, Hilal’s courts seem to have an uneasy working relationship with those of Jabhat al-Nusra, whose own heavily guarded Sharia court I’d passed on my way into the city. Would his government be more Islamic than Assad’s relatively secular Baathist state? Hilal seemed reluctant to comment but eventually said this: “The rules of justice are the same the world over. And there will be a charter to protect the rights of minorities.” I press him on how exactly his fledgling government would differ from the Baathist system. “It will be more Islamic, yes, but more modern.” Later, he shows me a montage of photos of rebel jurists who’d either been killed or are languishing in regime prisons. The war in Aleppo is never far away. mountains of rubbish line some of the larger streets; an old man serves coffee beside the remains of a burned-out tank; a boy of about 12 limps across the street, an intravenous drip feed trailing behind him. Many of the cars are festooned with bullet holes; a pickup truck we pass is carrying coffins made of cheap wood. Rebel-controlled hospitals, petrol stations and bakeries have been flattened by airstrikes and mortar rounds; at one bombed-out bakery, in the district of Kadi Askar, activists claim that forty people were killed waiting in the queue outside. In Ard al-Hamra, where a flurry of ballistic missiles in February killed scores, I see an entire residential area reduced to bricks. Smoke is still rising from the district of Sheik Maksud, where Kurdish militias, upset at the bombing of their areas, have for weeks been drawn into their own battle with the regime. In two days, I see a half-dozen armed men who plainly aren’t Syrian: one tall, angular Afghan stands guard outside a building, another speeds along on a motorbike, while a few North Africans share a moped and a Kalashnikov. What ordinary Aleppans make of this influx of freelance jihadis isn’t clear. When we approach areas thick with Jabhat al-Nusra, Abdul Kareem tells me to put away my camera. Given the scale of the damage, it’s surprising how many residents are still going about their business. Even in impoverished neighborhoods, street vendors ply a roaring trade in fruit and vegetables; buses under rebel control ferry people around town, with traffic policemen doing their best to control the flow. Abdul Kareem stops in several neighborhoods to stock up on coffee and sheep’s cheese and to chew the fat with old friends. “Bashar al-Assad is a donkey,” barks the cherubic owner of a coffee house as he grinds our beans. “And his father is a donkey. Two donkeys.” Everyone laughs. “These areas are very poor,” Abdul Kareem says later. 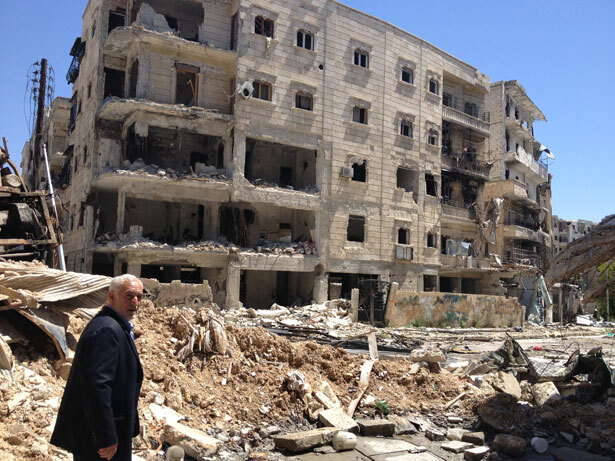 “The beautiful places in Aleppo we cannot see.” His own home in the neighborhood of New Aleppo is still firmly under government control; he has no idea whether it’s still standing. This was Syria’s richest city before the fighting, and many of its more prosperous residents are not yet convinced by this revolt of the pious, disenfranchised rural poor. Over there, on the other side of the city’s bridges, the war must look very different. In the evening, as we drive back toward the Turkish border, there’s barely a checkpoint around. We zip past the enormous, tree-lined army base at al-Moushat, one of Syria’s prestigious military academies before it was overrun by the rebels. “A hard battle was fought there,” says Abdul Kareem. “Hundreds of Syrian soldiers were killed.” Taking a detour, we bypass the rebel stronghold of Tal Rifaat, where last summer I interviewed a charismatic young battalion commander called Abu Nasr; he was killed the same day as Ayham. Abu Nasr talked about the threat from Menagh, the last remaining air force base in the area. Nearly a year later, the rebels are still battling for control of it; we meet some, fresh from the latest assault as they remove heavy guns from their trucks. In the past few weeks they’ve made some progress, even capturing some of the base, but they haven’t had everything their own way. The reason for our circuitous route, I discover, is that a militia from a neighboring Shiite village has arrived to reinforce the Syrian Army and has ambushed the rebels. Only as we near the border do I notice that Abdul Kareem has kept a pistol, wrapped in cloth, in the glove compartment. Abdul Kareem had invited me to come and have dinner at his refugee camp, and the day after we get back I take him up on his offer. I arrive early and we spend the afternoon in his steel container, chatting, drinking strong Arabic coffee and, out of the corner of our eyes, watching a rebel-friendly news channel. The minaret from Aleppo’s most distinguished mosque, a thousand-year-old world heritage site revered by Christians and Muslims alike, has just been destroyed in heavy fighting. Another friend of Ayham, a young man called Serj, was killed the day before; Abdul Kareem shows me his picture on Facebook. “I knew him well,” he says. “We all did.” From the same Facebook account, he plays me a propaganda video from Molham’s unit. With Islamist battle music for its soundtrack, the video shows fighters clad in black balaclavas, cocking their rifles above a half-dozen burly, kneeling shabiha; they almost certainly executed the prisoners immediately after. A few weeks later, I would hear that Youness has been killed too, in the course of a raid on army positions at Al-Izaa. One of his fellow rebels would send me a picture of his bloodied body, wrapped in a white shroud, and then politely request a photo of Youness from when he was still alive. Over a delicious dinner of roast chicken and aryan, the yogurt-based drink popular among Syrians, I ask Abdul Kareem how long this can go on. “One month if you give us weapons,” he says, in the familiar rebel refrain, “ten years if you don’t.” The Shiites, he adds, unprompted, “are the worst people in the world. They’re killing us, with knives.” His two younger sons have joined us to eat, and Saleh, his clued-up 13-year-old, uses his finger to mimic the act of slitting someone’s throat. It’s what they did to 5-year-old Khalil, he says. Also on the situation in Syria, in this issue: Mohamad Bazzi on “Hezbollah’s Gamble” and Lauren Wolfe on the plight of girls fleeing the civil war (“A Syrian Refugee Wedding”). James HarkinJames Harkin writes for The Guardian and the Financial Times. His War Against All: The Struggle for Northern Syria was recently published as a Kindle Single e-book.